KL10 Pathu malayalam movie directed by debutant Muhsin Parari featuring Unni Mukundan in lead role will star rolling very soon. Shine Tom Chacko, Mamukkoya, Sreenath Bhasi, Saiju Kurup, Aneesh Menon, Ahmed Siddique and Soubin Shaheer will give life to other prominent characters in the movie. Bijibal is composing the music. With Kozhikkode and Malappuram as the major shooting points, KL10 Pathu wlll reach theatres as a summer treat. After donning prominent roles in 'Vikramadithyan' and 'Fireman', the macho man of Malayalam film industry, Unni Mukudan is all set to sport a different look in upcoming movie 'KL 10 Pathu'. Helmed by debutante Muhsin Parari, this romantic comedy will kick start this month. Unni gives life to Ahmed, a football player. Ahamed is a semi-urban guy with a humour element in his personality. The pot of the movie has elements of sports which is directly connecting the main characters. Saiju Kurup too plays a footballer, Ahmed's elder older brother. A football camp is being organised for the artistes to get their moves in the right path. Sreenath Bhasi, Shine Tom Chacko, Aneesh Menon, Soubin Shaheer and Mamukkoya will also be seen in this rom-com. As the director wants to capture the game in the real format sans dupes, lead characters will play football, giving a visual delight for the viewers. Unni Mukundan and Saiju were working out at the gym to cut down their extra kilos for lean looks. Much intrerestingly, Unni had been working on the look for the movie for the past two months. As he had put a lot of effort to build up muscles, it is not so easy to bring it down. To bring perfection in the character, Unni had to include lot of running in his current fitness regime. 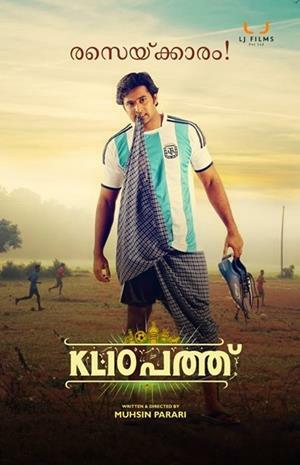 KL10 Pathu will be shot mostly in Kozhikode and Malappuram and is expected to go on floors by the end of January 2015. The cultural taste of Malappuram will be seen in the movie. Muhsin Parari has worked as assistant to Aashiq Abu and also made musical album 'Native Bappa' featuring Mammokoya. The music will be set by Bijibal. This romantic comedy is produced and distributed by Lal Jose under the banner LJ Films. Unni Mukundan will be having a busy year ahead with a handful of projects in kitty. His committed movies in 2015 include 'Blackout', and untitled ventures helmed by Nithin Ranji Panikka and Mossy.